The raw or green Sheng Pu Er (or Pu-erh) is made from wild Mao Cha. After drying, the unfermented tea is lightly steamed and pressed into one of the traditional moulds that give it its trade names. The most common cake-shaped form is known as ‘Bing’. These characteristic hand-made ‘tea pucks’ have a diameter of 18 cm, are about 2 cm thick and weigh about 340 grams. Gradually the Pu Er ripens in this form due to the Mao Cha’s natural bacterial flora – from an initially unfermented green tea to a fully fermented dark tea. This process takes between eight and ten years. Up to thirty years can pass before Sheng Pu Er is fully aged. 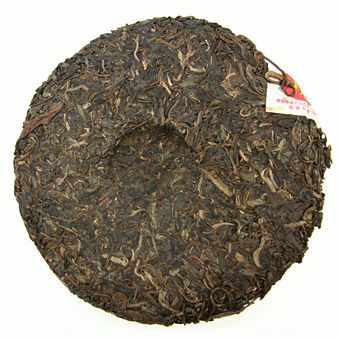 While Sheng Pu Er is still fresh and young, it has a pleasant earthy taste, but has a tendency to become astringent and bitter. As it grows older, it develops a milder and more balanced bouquet. Pu Er tea has been valued for its therapeutic qualities ever since the time of the Tang Dynasty nearly 1500 years ago. Numerous studies suggest that it lowers levels of cholesterol and blood pressure. It reduces triglycerides and helps prevent heart and liver disease caused by high blood fat levels. Pu Er is also known to detoxify the liver. It helps cure indigestion and infections of the digestive system and, due to its high antioxidant content, prevents cancer. It has an energising effect, which is why it is particularly popular in autumn and winter. Preparing Pu Er is an elaborate ritual and a delight for anyone who enjoys Chinese tea culture. Before steeping, hold the cake over boiling water for a moment in order to loosen the Pu Er and prevent it from crumbling, then carefully flake off one layer at a time. When serving the tea, always leave about 20 to 30 % in the pot, so that the Pu Er can continue to hold and unfold its flavour in the remaining water. Pu Er comes from the town of the same name in the Yunnan Province, where most of the over 320 varieties grow of the tea plant. Among them is the wild ‘King of Tea Trees’ that is over 30 metres tall and nearly 1700 years old. Wonderful article - very informative. Thank you so much for sharing with us.